DIY and environmental-friendliness were two popular trends in fashion industry. Did users realize the concept and put it into action? Mag was designed to research if people recognize the value in handbag design. The material of Mag are mycelium and home waste which expressed environment protection. Meanwhile, users could DIY their own shape with the service. 2) if users accept this material or even enjoyed using it. Therefore, the process was divided into two sections, which were material research and user research. Mycelium was a new bio-material. To use the material in design, a systematic understanding of the material was necessary. Therefore, I researched papers to gain fundamental knowledge of mycelium, and joined workshops to practice the knowledge. Meanwhile, I studied the technology that could improve the material in design, and did experiments to confirm the knowledge. 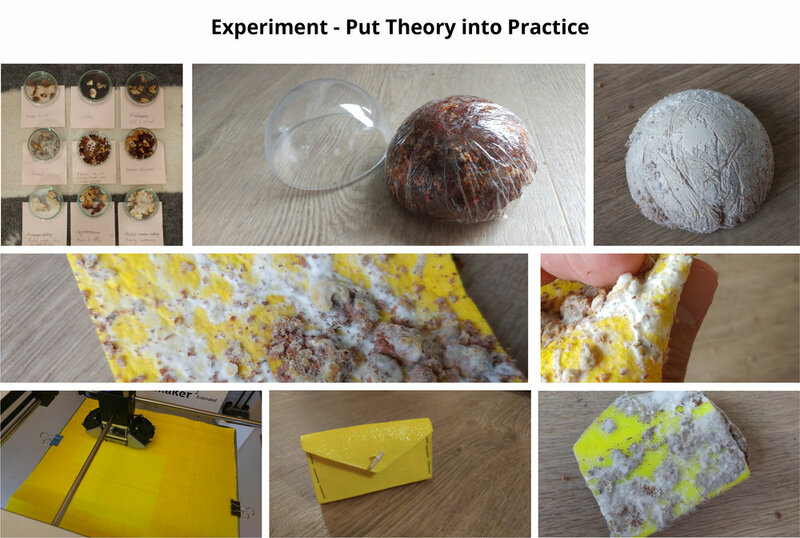 Making a DIY mycelium product required users to grow mycelium in a mould. Therefore, mycelium growing and mould making were two significant procedures in design. Users’ time of task completion, emotional change, behavior, etc, were recorded and mapped in metrics. It was found out that users generally enjoyed the process of mould making, however disliked mycelium growing because mycelium looked like stale food. Users could either make simple DIY moulds with online tools or make complicate mould in workshops. For those who dislike watching the growing of mycelium, they could leave their moulds in the shop to grow mycelium. Eventually, users could get their DIY mycelium bag when mycelium covered the entire mould. how to get a Mag? Users recognized and welcomed the trend of environmental-friendly material, however may had negative feelings towards mycelium which irritated their experience. Technology should be implemented to improve the quality of this material so as to increase social acceptance. Due to the lack of technical support in home environment, mycelium may not be desirable material of DIY products. Therefore, workshops or studios where users could get more support were necessary to improve user experience.